You have seven great options to choose from in Bodega Bay. Click here to view a complete list. You will also find information on lodging in the nearby towns of Guerneville, Occidental, Monte Rio, Bodega, Valley Ford, Jenner & Duncan's Mills. There are many different vacation rentals in the Bodega Bay area. Click here to view the Vacation Rentals Page. For additional information on camping & RV parks please visit the Parks & Beaches section. "Whatever your reason for visiting Bodega Bay you will find a lodging option to complement your stay. A range of B&Bs, Inns, Hotels and Resorts are here to serve your needs and desires.Vacation rental homes range in size from two person romantic getaways to party sized family reunions. 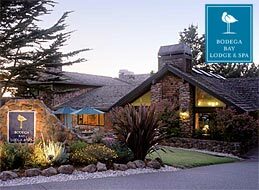 Choose a section to view a complete list of Bodega Bay lodging options."